Is Teeth Grinding (Bruxism) Causing You Pain? Do you wake up with a sore jaw, pain shooting down your neck, a headache, or sensitive teeth? 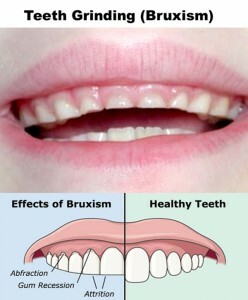 If so, you are probably suffering from Bruxism, commonly known as teeth grinding. Sleep bruxism, also known as nocturnal tooth grinding, is the medical term for clenching or grinding teeth during sleep. Occasional bruxism may not be harmful, but when it occurs regularly it may be associated with moderate to severe dental damage, facial pain, and disturbed sleep. People who have sleep bruxism can also suffer headaches, earaches, jaw pain, jaw joint disorders and damaged teeth. Sleep bruxism may also be linked with other medical conditions and have an impact on quality of life. Although the causes of bruxism are unknown, one study links it with factors such as, anxiety, stress, alcohol consumption, cigarette smoking, caffeine, sleep apnea, snoring and fatigue. Use of certain medications, including amphetamines, are also associated with episodes of bruxism. Most people probably grind and clench their teeth from time to time. Occasional teeth grinding does not usually cause harm, but when teeth grinding occurs on a regular basis, the teeth can be damaged and other oral health complications can arise. Since grinding often occurs during sleep, most people are unaware that they grind their teeth. However, a dull, constant headache or sore jaw when you wake up is a tell-tale symptom of bruxism. Many times, people learn that they grind their teeth from their loved one who hears grinding at night. In some cases, chronic teeth grinding can result in fracturing, loosening, or loss of teeth. The chronic grinding may wear teeth down to stumps. When these events happen, bridges, crowns, root canals, implants, a partial denture, and even complete dentures may be necessary. Not only can severe grinding damage teeth and result in tooth loss, it can also affect your jaws, cause or worsen TMD/TMJ, and even can change the appearance of your face. Dr. Caramico can fit you with a mouth guard to protect your teeth from grinding during sleep. If stress is causing you to grind your teeth, ask Dr. Caramico or your primary physician about options to reduce your stress. 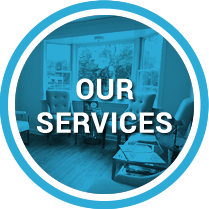 Attending stress counseling, starting an exercise program, seeing a physical therapist, or obtaining a prescription for muscle relaxants are among some of the options that may be offered. Avoid or cut back on foods and drinks that contain caffeine, such as colas, chocolate or coffee. Do not chew on pencils or pens or anything that is not food. Avoid chewing gum, as it allows your jaw muscles to get more used to clenching and makes you more likely to grind your teeth.